Hi, all!! We’ve had all kind of things going on lately- workouts, races, friends in town, trees falling on our cars, beautiful nephews being born, parties to plan, and so on and so forth. * The [happy] chaos had led to lots of cereal for dinner and very few blog posts (okay, NO blog posts), but I actually had time to cook last night! Real food involving vegetables, protein, and grains- and none of it came from the ready-made Whole Foods bar. Not that there’s anything wrong with that. Good wives go there all the time. At least that’s what I hear. You know, on the streets. In a large stockpot, cook your chosen pasta according to package directions. 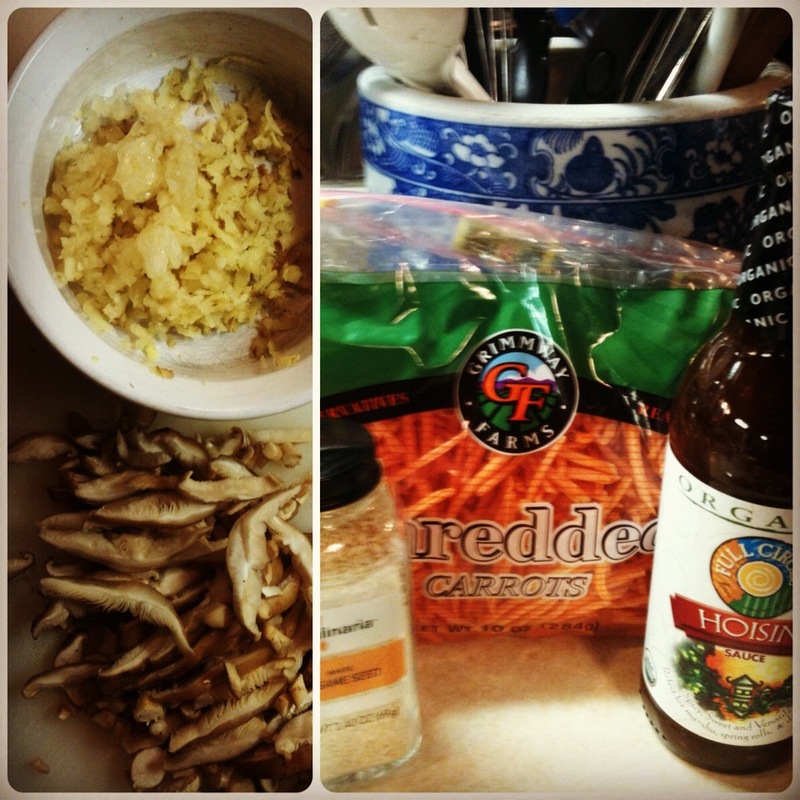 On a recent experimental gluten-free kick, I tried the Tinkyada brown rice pasta, and loved it. I was inspired to go gluten-free in an effort to resolve some long-standing stomach issues, by some of the ideas behind the Wheat Belly craze, and by the endorsement of Heather Wurtele, a professional triathlete I admire (I’m a nerd, I know). Side note: Heather and her husband Trevor (also a pro triathlete) live in a tiny RV and drive all over North America racing and training. That sounds like such a great lifestyle to me, so streamlined and focused! She’s very positive (check out their fantastic blog here) and she’s a fellow tall girl, which inspires me because she’s been very successful in a field of shorter, compact, fast little women who often seem to have a natural advantage in the sport. I met her in New Orleans and she had a big smile on her face all day, despite having taken a very violent and very public tumble off of her bike. She got right back up, placed 2nd (her hubby won the men’s division that day), and went out on Bourbon that afternoon, bandages and all. Her attitude completely won me over- she’s my fave. Oh- drain pasta and set aside. While the pasta is cooking and as you’re perusing the Wurtele’s blog, heat the sesame oil in a large, nonstick skillet over medium-high heat. 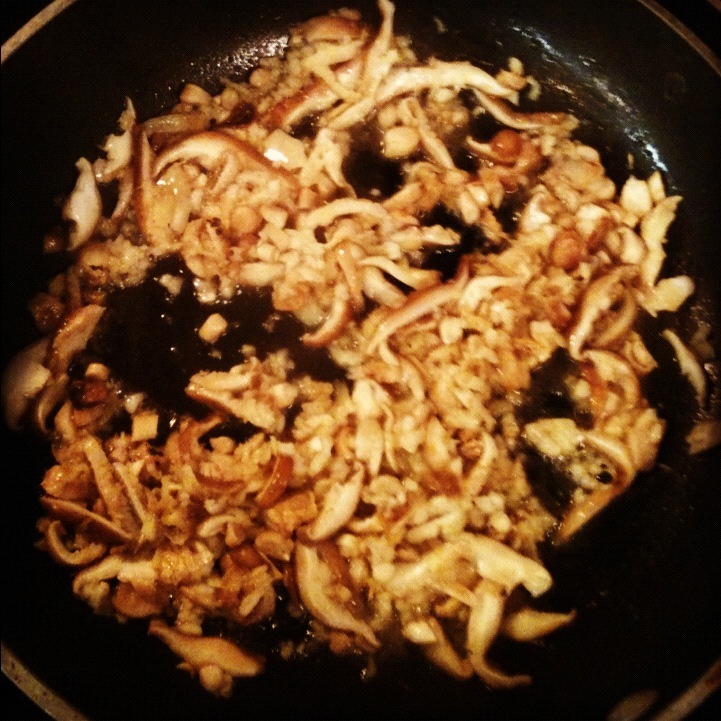 Once hot, add the sliced shiitakes, the garlic, and the ginger. Cook for three minutes, until the mushrooms are soft and the kitchen smells amazing. Add the pork [turkey, chicken], and cook for another three minutes, breaking up and stirring to cook evenly. Drain at this point if there is a lot of fat coming off of the pork. Add the hoisin sauce and pasta water, cook another 3 minutes, then add the entire bag of shredded carrots and cook until the pork [turkey, chicken] is completely cooked through and the carrots have cooked down a bit (you will know this when you see it). 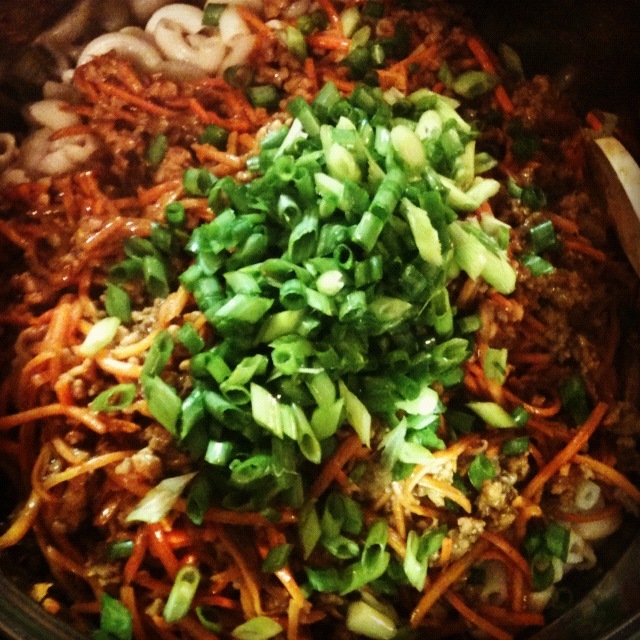 Place the drained pasta back in the large pasta pot and top with meat and veggies, then with scallions. Toss furiously! But don’t break up the pasta. That’s all! 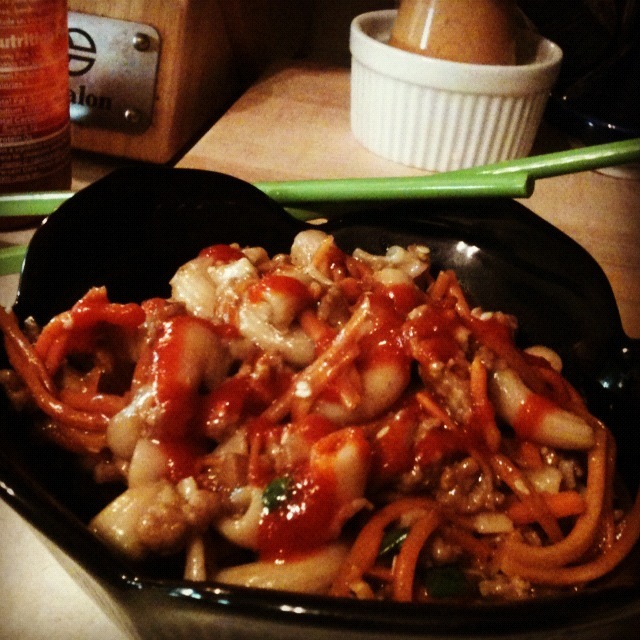 Serve with Sriracha (Cruse ketchup) and more hoisin, for those who’d like it. Quite a yummy and complete meal, and this will make a LOT for leftovers. Enjoy! This entry was posted in Dinner, Easy, Gluten free, Healthy Spin, One Pot, Pasta. Bookmark the permalink.